The SpaceX Falcon 9 rocket shown here launched 10 communications satellites into space for Iridium Communications on June 25. SpaceX is preparing to launch another Falcon 9 on July 2. 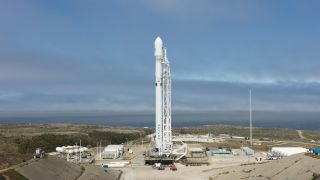 SpaceX is looking to extend its soaring flight rate with a third Falcon rocket launch in nine days, as the company works off a backlog of missions that piled up after an accident 10 months ago. The company's 39th Falcon 9 rocket is being prepared for liftoff from the Kennedy Space Center in Florida at 7:36 p.m. EDT (2136 GMT) Sunday (July 2) to put a hefty communications satellite into orbit for Intelsat. A live webcast of the launch will begin 15 minutes before liftoff, and you can watch it live here on Space.com. So far, SpaceX has successfully landed 13 of its first-stage boosters intact, including two that have both launched and landed twice, demonstrating the rockets' reusability. SpaceX offered to use a pre-flown rocket for the Intelsat 35e satellite, but Intelsat declined, said Ken Lee, senior vice president for space systems for Intelsat. "We have ongoing conversations about how many successful missions are needed before we consider that to be a reliable launch vehicle," Lee told Space.com. "Typically, there's a minimum of three." "I would have no qualms about using the pre-flown hardware in the future once they have fully demonstrated their reusability," he said. While the cost of launching on used rockets should be cheaper over the long run, the current price difference between launching on a new or pre-flown Falcon 9 booster is "very little," Lee said. More important than price, said Lee, is maintaining a steady launch cadence, something that SpaceX, which has had two accidents in 38 missions, is attempting to maintain. Dozens of missions, including the launch of Intelsat 35e, were delayed after a Falcon rocket exploded on the launch pad on Sept. 1, 2016, as the craft was being fueled for a routine pre-flight test. The accident destroyed a $200 million Israeli communications satellite. SpaceX previously lost a Falcon rocket and Dragon cargo ship during a botched launch in June 2015. "What's important for us is not whether you launch every other week, but [that] once you plan, you execute to that plan," Lee said. In the first half of 2017, SpaceX flew nine missions, surpassing its previous annual flight record. The company's last launch was on June 25 from Vandenberg Air Force Base in California. For Intelsat's launch, SpaceX is returning to its primary launch site in Florida, where a Falcon 9 last blasted off on June 23. The company is on track to launch more than 20 Falcon rockets this year, including the debut flight of its Falcon Heavy mega booster, which will use three Falcon 9 rockets as its first stage.